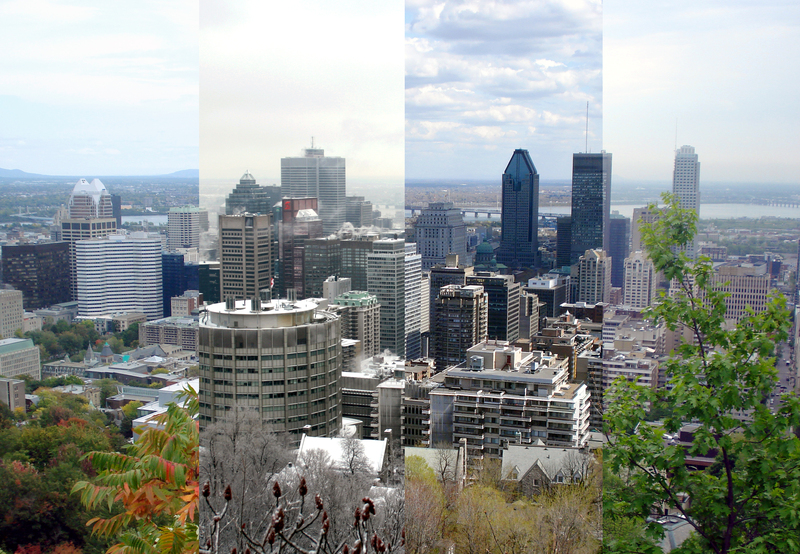 An imperfect composite of pictures taken during lunchtime walks up to the Belvedere overlooking downtown Montreal. Well, all the people who know me now know that we decided to and have moved back to Chicago. In some regards it was not an easy decision while at the same time it was an easy decision. Life changes like that can be complex and considering a choice between two great cities and locales is not simple. I could rattle off all the pros and cons of the move along with the variety of reasons to justify it, but it really boiled down to happiness. Stepping back from it all, we looked and said that we feel that we will be happier in one place more than the other and that it is the right thing for us to do as a family. If you really want to hear about everything involved including all the logistics, I suggest you go to my new blog that I have used to document the process and our thoughts. It is appropriately called “The Prodigal Chicagoan”. As I said this was not a referendum on Montreal. We love Montreal and loved living there. It is a city that offers big city culture with many conveniences of a smaller town. Plus it has easier access to nature and nearby mountains. I ran into difficulties living there, but that might not happen to everyone. We had a great time in Montreal with many memories. We have grown as people and have gained experience while living there which will make us stronger people than if we had not lived there. We have made some great friends who I expect to keep throughout my life. Almost all of whom I met through the creation of this blog. Some might ask if we would move back to Montreal. It’s a hard question to answer right now since we are in the honeymoon phase of our time in Chicago. Plus many of my difficulties were rectified with the move. If those difficulties were no longer there, I would say from a personal stand point that it would still be hard only because our return has shown how deep our root are in Chicago despite 10 years away. If the difficulties I experienced in Montreal were gone and my roots in Chicago were not a factor, then yes I would return. Given the fairly winding road my life has taken me, I have learned to never say never. Life changes and sometimes takes you in directions you never would have expected. When I was young I thought I would live my whole life in Chicago, but life has taken me to Europe and Montreal and there were possible side trips to Asia and the Caribbean that didn’t materialize. So for now this is Adieu, Montreal. We will still see you often to visit family and friends. We shall see if our paths cross again in the future. BTW, a post on the formal closing of this blog will happen in the near future. So this is not a final good-bye from this blog. Yes, once again there has been yet another effort to ‘protect’ Quebec ‘values’ in the news as of late. If I sound cynical that this truly is an effort to protect, it is because during my ten years in Quebec I have heard this repeated in efforts to ostracize all ‘others. During this most recent debate, there has been a Charter of Quebec Values that has been proposed. The Charter started as a ban against all large displays of religious garb or jewelry by public employees. This includes turbins, hijabs, kippah, and large crosses. It was later diminished to those public employees who might exert authority over others such as judges, police officers, doctors, and daycare workers. The justifications for the charter include extending secularism and protection of womens rights. Quebec made a strong movement away from religion in the late 60’s and early 70’s and there is concern that certain religions suppress the rights of women. There was also concern that those displaying their religion would influence those below them into following their religion. The arguments against the charter point out that the charter encroaches on the right of people express themselves. It is also argued that by prohibiting women who wish to display their religion and who do not follow tenants of the religion that suppress women, that they are in effect suppressing the rights of those women. The lack of overt expressions of religion would also limit the exposure to people of different religious backgrounds. After spending some time disappointed both at the amount of support for the charter and the actual arguments for the charter, I realized something. We have been through these types of arguments frequently and looking at them all you really see what is trying to be done. There were the reasonable accommodation debates and the Bouchard Taylor commission. This included daily feedback from the public about how ‘others’ (mainly Muslims) are trying to infiltrate Quebec society and undermine it. A small town with no Muslims even wrote into law a ban against stoning people to death. There are repeated proposals to limit the use of languages outside of French. The majority of non-native French speakers make strong efforts to learn French so efforts to suppress all other languages is not necessary. Then there was the unnecessary soccer turbin ban last summer in the name of safety. Also last summer there were efforts to prohibit special parking privileges of Jewish people celebrating their holidays. When you look at all of these together, it is hard not to come to the conclusion that people are trying to make ‘others’ not feel welcome. As an outsider, it continues to reinforce the idea that I am an outsider regardless of which group is targeted. It is also very difficult to see how many people support these efforts. They agree with the justifications, but may not realize how it has been difficult for those believing in the province and who came to the province for the tolerance and accepting nature. It fosters a feeling that people are not truthful with you and secretly want you to leave. It would be one thing if it was once or twice, but repeated popular efforts along the same theme makes it hard not to believe. The reputation of the province has been damaged by these repeated efforts and unless they stop, people will continue to think the province is intolerant. 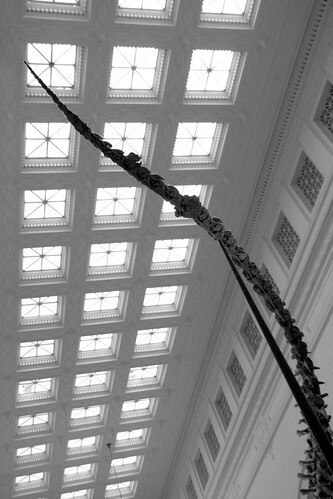 of the Tyrannosaurus Rex skeleton at the Field Museum in Chicago. Despite how busy I am currently, I felt compelled to add my two cents to the current topic of the turban ban by the Quebec Soccer Federation. For those who are unfamiliar with what has transpired, last week the QSF banned the wearing of turbans by Sikh players while playing soccer. Since the Sikh’s are required by their religion to wear the head wear, it effectively means that Sikh children are not allowed to play organized soccer in the province. There has been a very vocal uproar and the QSF were forced to give a reason for the ban. They responded that it was for safety concerns and dismissively stated that the kids can just play in their backyard. This past Monday, the Canadian Soccer Association suspended the Quebec Soccer Federation until they lifted the ban. Politicians of course have weighed in. A few siding with the QSF and admonishing the CSA for meddling in Quebec affairs. Others disagreed both with the ban and the suspension since it is ultimately the kids who are paying the price for this. The morning radio shows have been discussing this at length and online commentary has made charges of racism and intolerance. Many point to it being another example of Quebec intolerance. I did find one discussion quite enlightening where one panelist pointed out how Quebecers are very tolerant and friendly people in person, but when it comes to policy and politics, they become extremely protectionist. If you live here, you experience one reality while in the media and from elsewhere there appears to be quite another. But back to the ban and my take on it. I very much wanted that there is a valid reason for the ban, but I have yet to hear one. The main reason has been for safety, but there has been no statistics or examples of harm done provided. It was not like there was a string of injuries to back up the claim. There has been a claim that turbans are banned in the official FIFA rules. But I’ve also heard people say that there is no official direction by FIFA. Plus Quebec is now the only jurisdiction with this ban. If it is an official FIFA rule, why are other jurisdictions not following it? It would make more sense if there were other jurisdictions with this ban, but there are none. So without any real valid reason for the ban, it sincerely appears to have come out of the blue due to the whim of someone. Unfortunately due to the multiple instances of perceived or real intolerance, that is what people are going to assume. The truly sad thing about this is that the group that is banned is children. In a world where we hope to propagate tolerance and community, showing intolerance to impressionable children is the wrong direction. 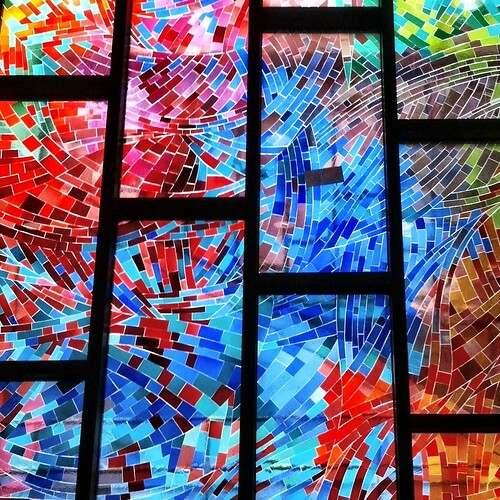 The stained glass windows by Mario Merola and Pierre Osterrath in the Charlevoix station of the Montreal Metro. 1976. With the passing of Roger Ebert today, I am once again reminded about PBS and Sunday afternoons and I’ve come to realize how much that lineup of shows during my childhood has had a strong influence on my interests. Granted, it was long enough ago that I can’t remember which shows were on Sundays and which were on weeknights, but just the same, these are the ones I remember. Of course there was Sneak Previews with Siskel and Ebert. The show was special not only for the preview and critique of new movies, but also for the respectful discussion between the two of them. I suppose my interest in film and cinematography came from that show. I tend to be more critical of movies and look for ones that are different from the norm. I think everyone in the construction industry grew up watching This Old House. It is what sparked my interest in becoming an architect. It was fascinating to see how the buildings we live in are constructed and how they can be made better. After all these years, I still watch it on Sunday mornings. Nova was a must-see show for me. I’ve always loved science and how deeply it is intertwined with every aspect of life. It wasn’t just showing you animals in the natural habitat, it went into depths about their ecosystem, social structure, and biology. I especially loved the shows about space and astronomy. It was a show that made you think. There were at least three different cooking shows that I remember. The Frugal Gourmet, the Cajun Cook, and The French Chef. Everyone loves to eat and to learn how to cook better. I don’t doubt that it has helped my cooking habits over the years. Then there were the painting shows. I never did take up painting except for a watercolor trip I took while in Europe, but it did help me appreciate art and see what was involved in making it. Especially how it is not necessary to be perfect and how mistakes can become part of the art. Lastly there was Monty Python’s Flying Circus. I’m sure my often dry humor comes from those shows. It also gave me a running start to understand British culture. I’m still a big fan of that show. After we had our kids, I used that experience during my childhood as a guide for what I wanted to pass along to our kids. Though it hasn’t been easy since there hasn’t been a lineup of shows of that caliber. We usually watch the local science program on Sunday evenings, but it has been difficult to find other shows that are not reality programs or dumbed down nature or top ten shows. There are other ways we’ve been making up for that, but it’s not like that weekly exposure to those different aspects of life.